I have been on a Japanese fest these past few weeks. I guess mostly out of guilt from all the post holiday eating fests, and therefore Japanese cuisine seems most appropriate for something relatively "healthy". 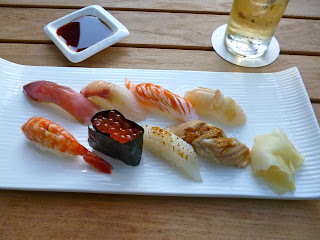 And so to continue our Japanese food streak, my husband and I ate at HY California in Marina Bay Sands. This is celebrity chef Hide Yamamoto's casual Japanese fusion restaurant. The place is overlooking the bay at the top floor of the Shoppes at Marina Bay Sands. It has an al fresco dining area which is just lovely and has a very relaxed atmosphere. 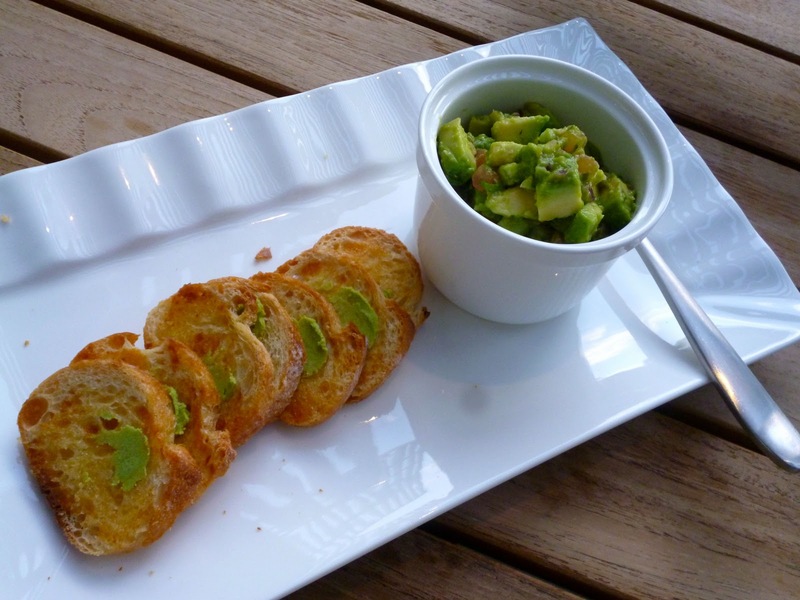 For starters we had the Wasabi Guacamole (SGD 9.00). This was a very refreshing combination, and the bruschetta had a pleasing kick from the wasabi spread. 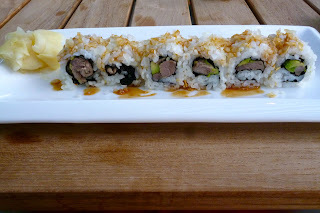 For mains, I had the Texas Roll (SGD 18.00) which was made of angus beef, avocado, onions, and steak sauce. 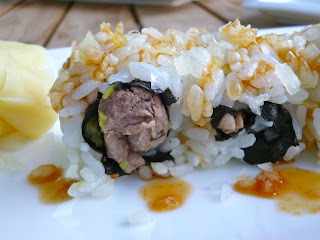 I thought this was an interesting twist to the usual japanese roll. This was pretty tasty though the angus beef was on the tough side. My husband had the Chef's 8 (SGD 48.00) which is an assorted Nigiri. Nothing creative about this versus the other dishes, though the assortment of seafood was not bad. HY California is a good place for a light meal and great ambience. Very relaxed and almost romantic vibe to the place. Dishes were pleasant, but I guess I had not found anything worth raving about. I don't mind coming back and hopefully try out other more interesting finds in their menu.